It’s 8:30pm. You had a long day at work / you just got back from a tough run / insert the reason you’re tired and haven’t already eaten and might cry if you don’t get something delicious in your belly soon. What do you? Do you order in and wait half an hour or more for delivery? Do you break open the little blue box of mac and cheese? No, of course not! 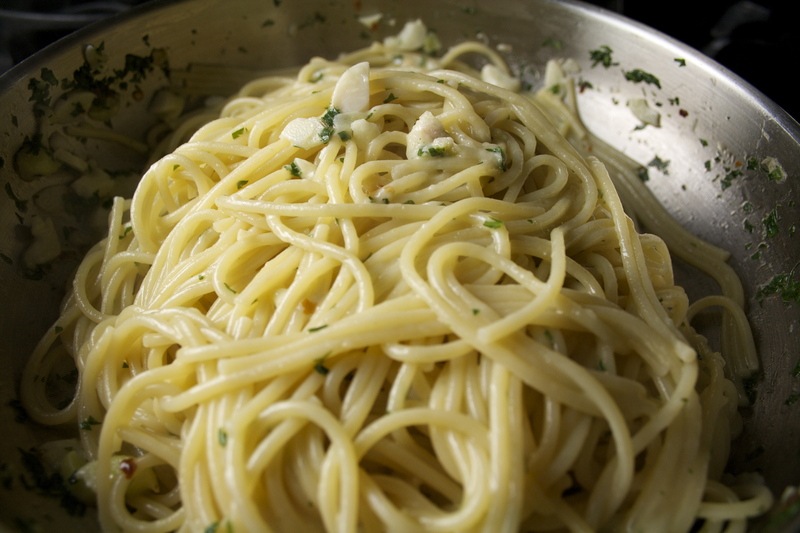 You grab a few cloves of garlic and spend 15 easy minutes making rich, velvety spaghetti with garlic and olive oil. 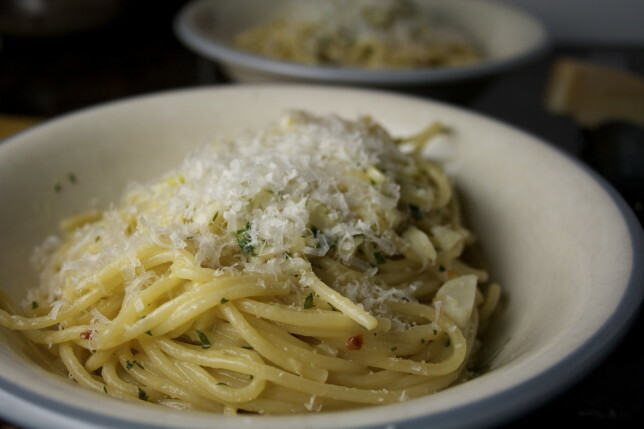 Spaghetti aglio e olio, as it’s called by its Italian creators, is so easy even my cats could make it if they craved garlic like I do. And had opposable thumbs. This is one of those pantry staple dishes that I don’t really use a recipe for. Its origins, for me, lie with Lidia Bastianich. Lidia’s Italian-American Kitchen taught me how to make this — but even at the start, I don’t think I used her recipe word for word. This is my go-to dinner for one, and hers is for the family, so I’ve improvised from the start, and I’d be remiss if I didn’t tell you that I still improvise today. 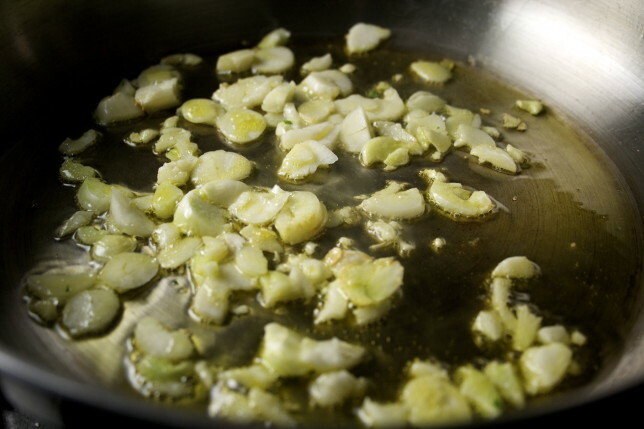 I like a minimum of three cloves of garlic in my aglio e olio, but I’ve been known to make it with as many as five just for myself. It mellows out as it toasts in the olive oil and simmers in the added pasta water. Fresh parsley adds a gorgeous freshness, but unless I have a leftover bunch from something else I’d made previously, I usually use dried — a handful, if I may. I use maybe three shakes of red pepper flakes for a hint of heat. I’m not exactly sure how much of that would fit into a teaspoon. 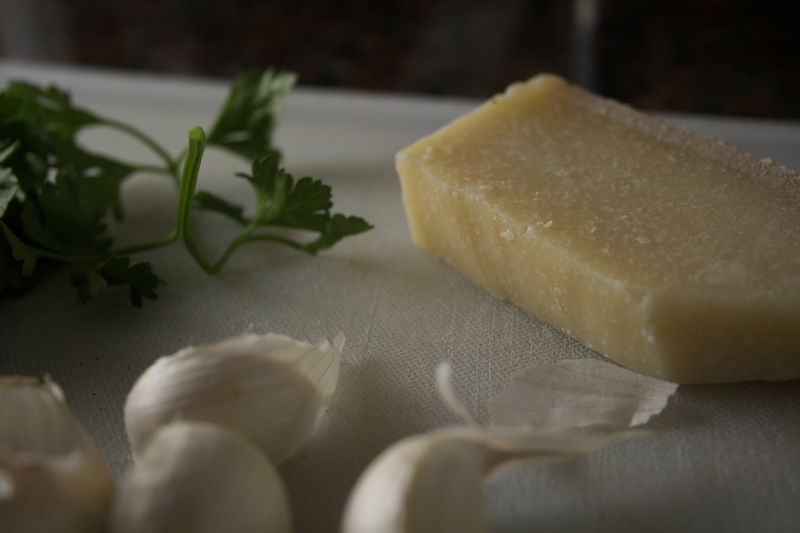 And I use cheese — layers, and layers, and layers of salty, nutty parmigiano reggiano. I can’t lie. I just added another layer. 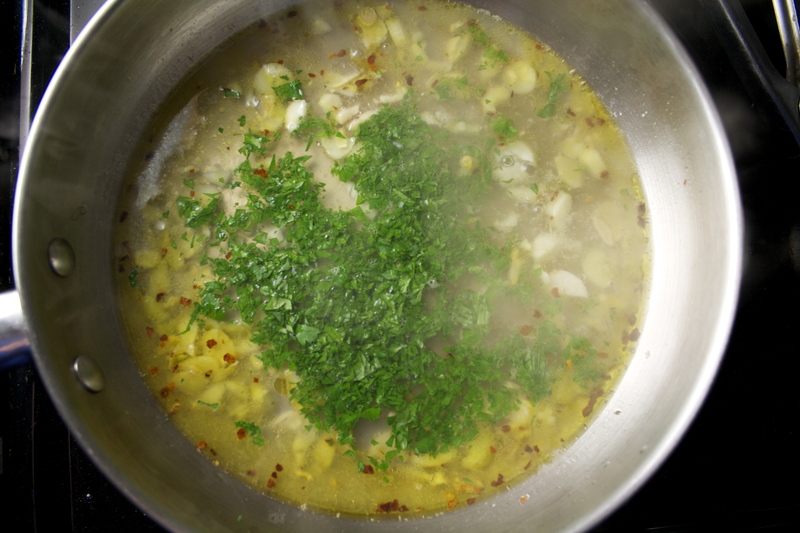 The combination of olive oil and starchy pasta water thickens when combined and simmered together. Adding the parm truly brings it together — the sauce was cohesive before, but with parm it’s unstoppable. 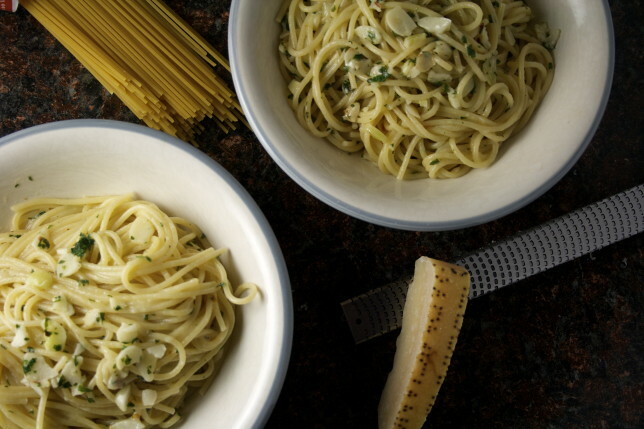 It helps the flavors cling to the pasta even more, so that every bite tastes of that mellowed garlic, whether or not there’s a slice of it on your fork. It’s velvety but it’s light. It’s silky but it’s rich. This is truly my go-to pasta dish after a long day, after that long run or tough workout, or when I’m just craving garlic, which, honestly, is most days of the week. It comes together just a few moments longer than it takes to boil water and cook spaghetti (which, if it’s a thin one like spaghettini, is about ten minutes total). Pair it with a side salad and a glass of wine — or, really, just a fork and a napkin — and you’ll be glad you left that little blue box in your pantry. This recipe serves two but is incredibly easy to adjust for one or even four. My general rule of thumb is three cloves of garlic per person, unless they’re either very large or very small. The ones I used for the batch you see in the photos were six average-sized cloves, and it was perfect for the two of us. Probably the best batch I’ve made. Bring a pot of salted water large enough to hold the pasta to a boil. I add a handful of salt — this will help pull out the starches. Stir in the pasta and cook until just barely al dente. Meanwhile, heat up a 10-inch saute pan over medium heat. Test it by throwing in a drop or two of water. If it sizzles, your pan is ready. Add olive oil and let it heat for just a moment. Slide in your sliced garlic and cook until lightly golden brown, taking care not to burn it. If it’s cooking too fast turn down the heat — it’s better to cook it at a slightly lower temperature. Once it’s lightly browned, take the pan off the heat and add some red pepper flakes, up to a quarter teaspoon, but I like to add less — just a few shakes. 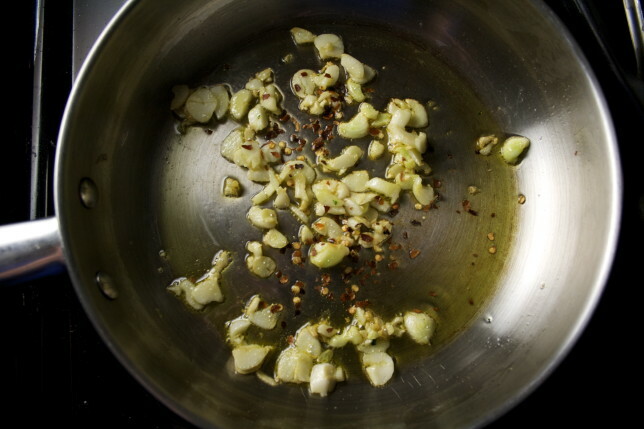 Let the pepper bloom for 30 seconds, then add two ladlefuls of pasta water. 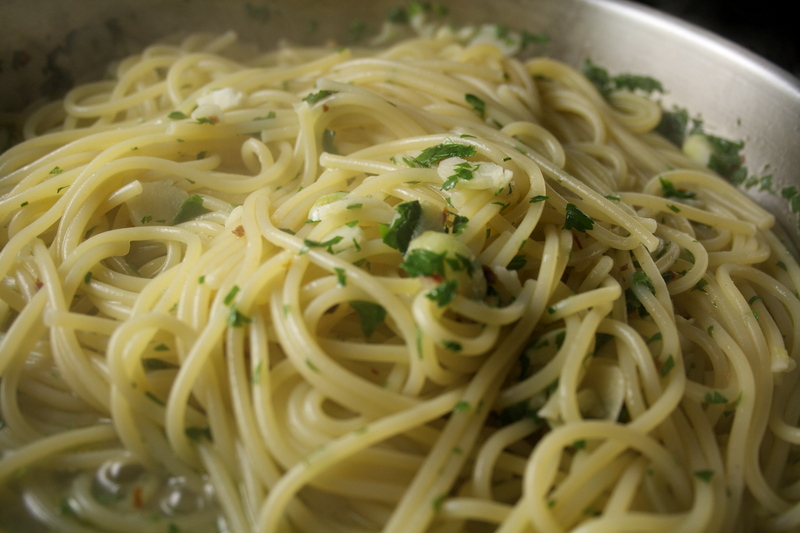 Return the pan to medium heat and stir in parsley and salt to taste. Let the sauce simmer gently while you wait for the pasta. Once the pasta is al dente, add it directly to the sauce (if your pan isn’t big enough, drain the pasta (reserving some extra pasta water), return it to the pot, and pour the sauce over), and toss to coat. Add more pasta water one ladleful at a time if there isn’t enough sauce, and let it thicken and reduce a bit. Take the pasta off the heat and add the parmigiano reggiano in two batches, tossing each time. Check the seasoning and add more salt and red pepper to taste. 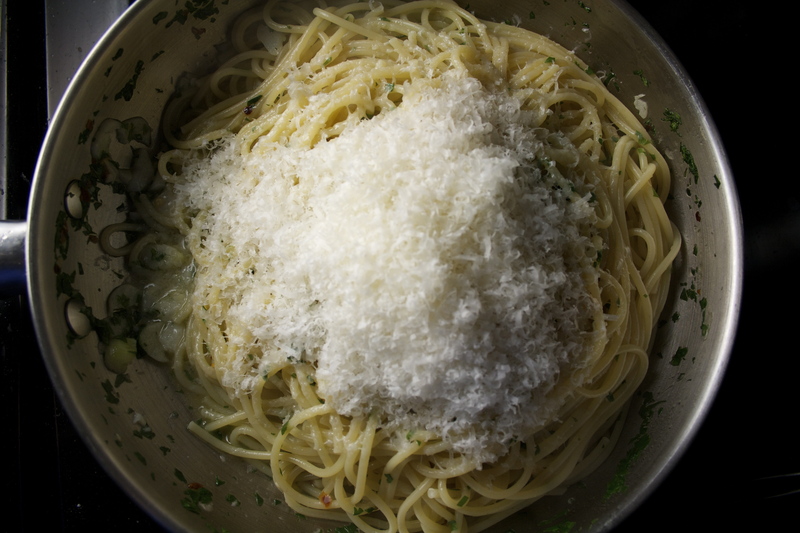 Serve immediately with an extra grating of parm. Thank you so much! After reading your blog I knew I had to make this treat. It’s always my go to when I go out for Italian, but was always scared to try it myself. Even at 33 years old, I’m ashamed to admit that I’m a very weak cook. However, with my recent snow day looming, I gathered the ingredients and prepared to make this dish. The pictures save directions provided increased my confidence! True to your blog it was a 15 minute meal and one that I not only enjoyed, but was proud of making upon completion. Your post inspired me to attempt other meals. That’s great, Barbara! Always best to start simple. I bet you’re a stronger cook than you think you are! My mother used to make this not with that much garlic . She used breadcrumbs, seasoned of course with parsley and cheese. Definite comfort food for this evening. I love pasta with toasted bread crumbs! Such a wonderful combination of textures. I just made this for lunch today. It was so easy, and so delicious! It’s a marathon training favorite!